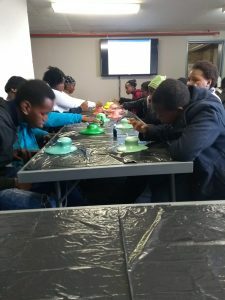 On the 9th of March the awarenet core group made an excursion to the Scifest – the annual Festival taking place in Makhanda/Grahamstown which showcases science, technology and innovation. This article is put together by videos and text created by the learners of the grade 10 core group themselves. The first workshop was about physical and chemical reactions. We did an experiment where we mixed poly A, poly B and food colouring and it came out as foams with different colours. We did an experiment about a foam and we made hats out of them. The second workshop was about observing different colours from different lights and we made a little box with a CD inside it. We also attended a love chemistry workshop whereby we were told about the formation of love. We were also told about what goes on in a person’s mind when one is in love. We also learned that love is a form of addiction. We also watched a laser X show that showed us how science can be very cool. This was made by three guys who are technical operators in Idols. 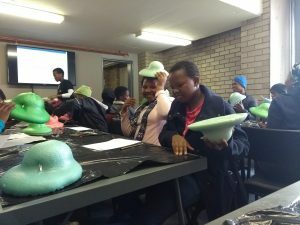 Then we went to another interesting workshop that was about being creative scientifically and thinking outside the box. This show was run by an American lady who taught us about different cultures and how life could be like on other planets. 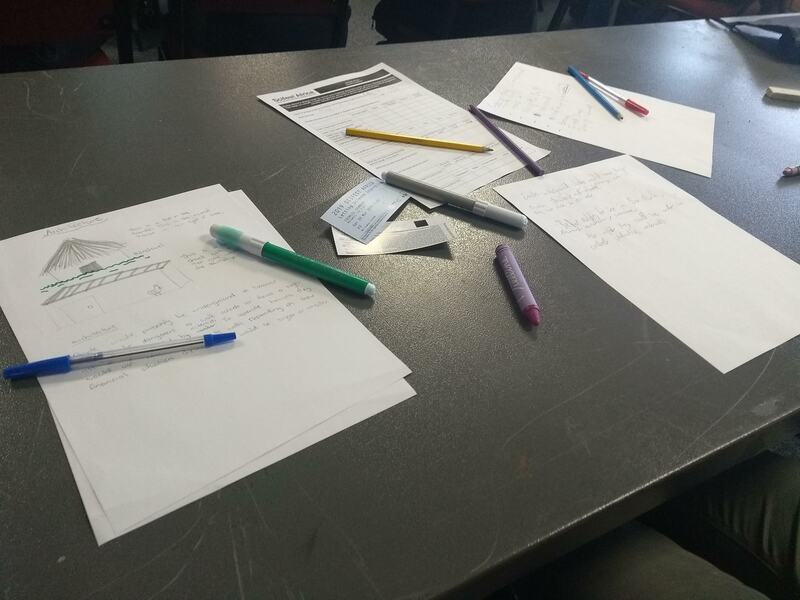 Each and everyone was given a paper and some pencils and we were told to choose a culture and write something about it. 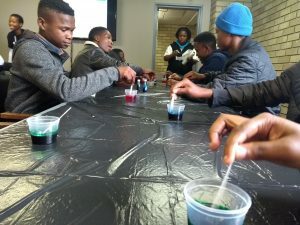 The festival made it possible for everyone in Makhanda to have knowledge about science even if you are not doing science but you can feel part of it. l hope we have learnt a few things about science. I believe that to have knowledge about science you don’t need to study science or become a scientist. This Blog post was created by the members of the Learning Group Grade 10. 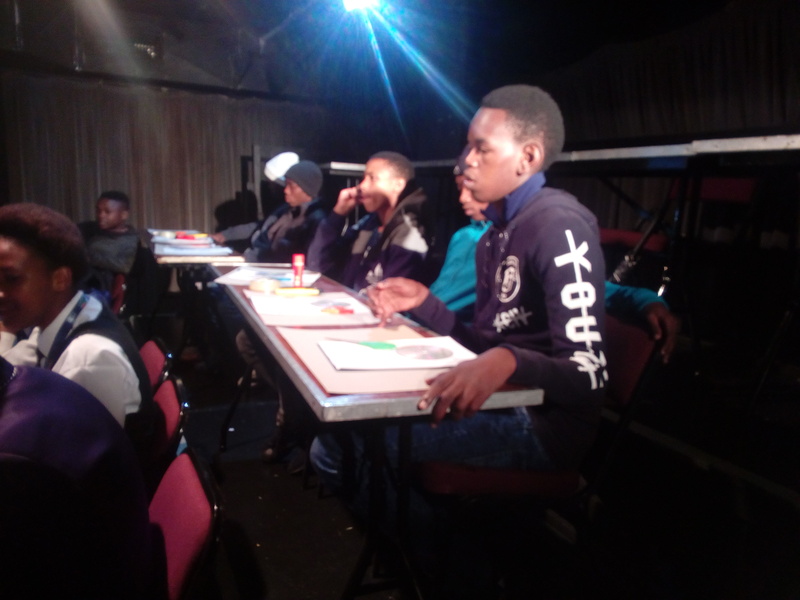 This entry was posted in awarenet projects, events, Joza Youth Hub, Khutliso Daniels SS, members, Nombulelo SS, Ntsika SS, Our organisation, partner schools, SciFest, Uncategorized. Bookmark the permalink.